There’s a day for giving thanks. Two for getting deals. Another for Shopping Small. Now there is #GivingTuesday , a global day dedicated to giving back. Celebrated the Tuesday after Thanksgiving, #GivingTuesday kicks off the charitable season, when many focus on their holiday and end-of-year giving. 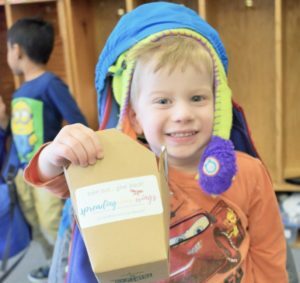 As part of this worldwide celebration of thanks and giving, Mountaineer Montessori School will launch its “Spreading Our Wings: Elevating Education and Our Community”annual fund campaign. The fundraiser gets an early start today, Friday, November 16, when coin boxes were distributed to all MMS students, who are encouraged to fill them over the Thanksgiving holiday and bring them back to school on or before #GivingTuesday, November 27. The “Spreading Our Wings” campaign will unfold over coming weeks through social media, news coverage, collaborations, annual appeal ambassador stories and personal invitations to engage the entire community in meeting the demand for world class education and serving families of all income levels through a tax-deductible donation to the school. Last year’s MMS Giving Tuesday/Annual Appeal enabled Mountaineer Montessori to implement major facilities upgrades, sponsor out of state training for several teachers and sustain increases in increase financial aid support.